Lewiston, NY - Members of the Lewiston Garden club work on the landscaping at the Lewiston Library. The Lewiston Garden Club were out in force sprucing up the the Village of Lewiston on Monday at Hennepin Park, Lewiston Library and other locations. To: Mark Scheer , "james.neiss@niagara-gazette.com"
Good morning Mark & Jim – on Monday, May 21, members of the Lewiston Garden Club are breaking out their gardening tools and will be planting hundreds of flowers throughout the Village of Lewiston as part of their annual planting day. Included below are some more details. Would you consider coming out that morning to take a few photos to share with your readers? 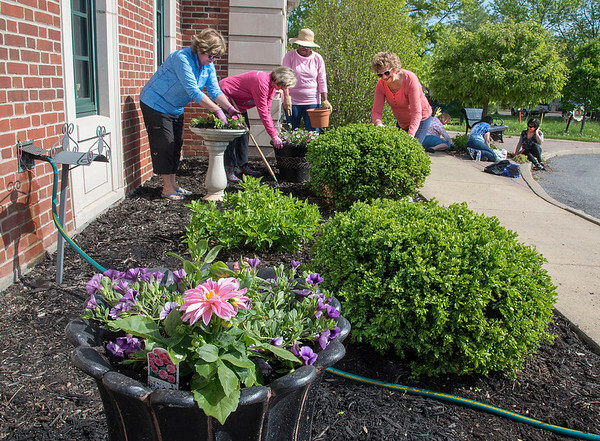 WHAT: Members of the Lewiston Garden Club are breaking out their shovels, spades, pots, planters, and green thumbs for their annual planting day throughout the Village of Lewiston. Gardens will be spruced up, weeds pulled, and hundreds of flowers will be planted by the all-volunteer group. Members will continue to water and maintain these plantings through the end of the summer. WHEN: Monday, May 21 from 9:30 a.m. to 11 a.m. The Lewiston Garden Club is made up a very enthusiastic group of women who enjoy digging in the dirt and volunteer to put their green thumbs to work for the benefit of the community. They maintain a vested interest in the landscapes and gardens throughout the Village of Lewiston’s public spaces, having taken the initiative to improve the historic village from a gardening perspective for more than 90 years. In addition, the Lewiston Garden Club is preparing for its biggest fundraiser of the year, Lewiston Garden Fest on June 16 & 17. All proceeds from the event go back into the soil of the local community for civic beautification efforts, including the flowers for this annual planting day.